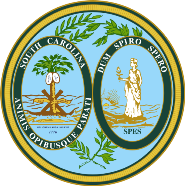 The South Carolina state seal identifies government buildings and officials and the palmetto tree is a centerpiece for the South Carolina state flag. Fact 3: South Carolina was the 8th state in the USA; it became a state on May 23, 1788. The palmetto tree symbolizes victory in a battle against the British fought from a fort made of palmetto logs during the Revolutionary War of Independence (1775–1783). The square-shaped Fort Sullivan consisted only of the completed seaward wall made from palmetto logs 20 feet (6.1 m) high and 16 feet (4.9 m) wide. The standing tree is symbolic of the victorious defenders, and the fallen oak tree symbolizes the defeated British Fleet. The other image on the South Carolina seal depicts a woman walking along a shore that is littered with discarded weapons. The woman is the goddess Spes (Hope) who grasps a branch of laurel as the sun rises behind her. In heraldry Laurel leaves are the symbol of triumph; success, renown, glory and victory. The South Carolina seal is kept and used as required by the Constitution and laws of the state. This is an early flyer depicting the South Carolina seal. The pictures reflect the lifestyle and industry of the early inhabitants. Slave labor in the South Carolina plantations was integral to the economic success of rice and indigo as commodity crops and this is illustrated in the images. South Carolina Official Nickname "Palmetto State"